Last week I finally finished the trooper story for a second time. It may come as a surprise to some that it took me nearly four years to level an alt of the very first class I ever rolled, especially since I levelled two of most other classes during that time. I'm just fickle when it comes to playing alts and my whims can be quite random. 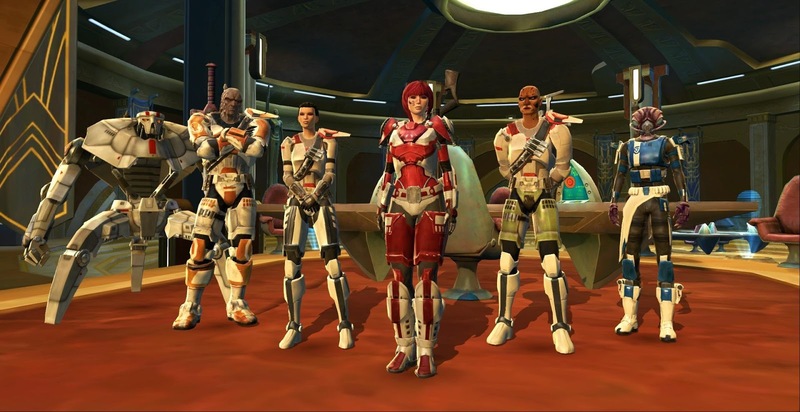 This particular character, a Vanguard, was actually created in late 2013 - I found a screenshot of her on Ord Mantell that I posted in November of that year. (Fun fact: In that post I complained about finding too many freebies in my mailbox on every newly created character: fourteen items! By now, I'm up to forty for every new alt.) Since then my interest in her has been an on-and-off-again affair. For the first couple of months I thought she might even end up being my 10th character to the level cap, but then that didn't happen. Later I went through long periods of disinterest, interspersed with the occasional GSF match or late-night questing session. 4.0 actually invigorated my interest in the character in so far as I knew that with the changes to levelling the rest of my class story alone would probably be enough to carry me close to the level cap. I just had to round it off with the Ilum story arc and the Belsavis bonus series to actually hit 65. What did I think of the trooper story the second time around, especially compared to my initial thoughts from back when I hadn't played any of the other class stories? Well, I have to admit that it's probably one of the weaker class stories overall, now that I have actual points of comparison... you just lack a feeling of agency, being bossed around by General Garza all the time, though at least chapter one gives you a strong personal motivation for your actions as well. At the same time, it actually feels weird just how much you do get away with - I'm no military woman, but I'm pretty sure that the military cares about methods as well as results. This wasn't as noticeable in my first playthrough where I was mostly light side, but this time I veered more towards neutral, repeatedly disobeying orders... and every time the mission ended with Garza giving me a stern-talking to at first and then suddenly switching to: "... but oh well, I guess you got things done. Good job!" My initial thoughts post was however spot on about how Havoc Squad feels like a natural unit. Even after playing through all the other class stories, none of the other companion crews have quite the same natural feeling of belonging together, so that is still a point in the trooper's favour. I was going to focus on levelling with Elara this time, since I had hardly used her on Shintar (healer + healer companion was not a good combination) but eventually ended swapping her out for M1-4X anyway, just like I had done with Aric the first time... 4X is just too much fun, and with every companion being able to fill every role, his former tankiness wasn't an obstacle anymore. What was most interesting for me to re-play was the last class mission on Corellia. Without going into spoilers about the actual story, gameplay-wise you are being asked to choose one of three attack vectors while NPCs will cover the other two. 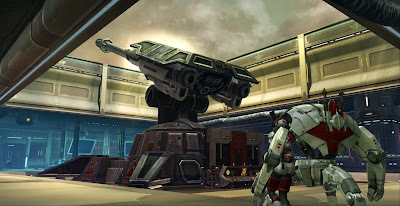 They are described as pitting you either against infantry, walker droids or "automated systems". On Shintar I ended up facing off against the droids because they were described as the hardest and I was very gung-ho about proving that Havoc Squad can take on anything. This time I decided to listen to what advice the NPCs had to give and ended up fighting the automated systems instead. I was kind of hoping that there would be puzzles but... well, the first corridor looked like it might have had a puzzle in it, but if there was one I didn't figure out what I was supposed to do and just ended up getting the whole floor covered in ooze that didn't seem to do anything. The rest was mostly turrets and weaker droids though, which wasn't that exciting. What I did love was that there was a bonus mission to blow up barrels! Best bonus ever! Plus I got to hijack an anti-aircraft gun and shoot down an Imperial shuttle; I don't remember getting to do that last time either (though I'm not entirely sure about that, it's been four years after all). So... once again I'm in the position of having a tanking alt at the level cap. Last time that happened, when my Shadow hit 55, I got quite excited about the prospect of tanking casual ops runs for alts, but then that never happened, so I'm not getting my hopes up this time. But it will be nice to have the option. I took the same path that you did your first time, and you are correct that you didn't get to hijack an AA turret in the droid path. Instead, you hijack a targeting beacon for the imperial bombers and use them to destroy one of the giant droids. Still just as fun, using the Imperial forces against themselves. Ooh, thanks for the reminder! I totally don't remember that bit.